January 22, 2013 by Venky. Other posts in the series are here and here. The Weight Owes Continue: How Lucky!! I recently read a book by a Japanese writer Haruki Murakami who is also a longtime marathoner. In the book he mentions how his wife doesn’t gain any weight despite eating whatever she wants and not exercising while he tends to gain very easily. He also says that he feels that he is luckier than his wife because, his tendency to gain weight means that he needs to be working-out regularly and that helps him stay healthier for longer. I think that is a great way to look at it. So, I must say, I’m really lucky that way too. After TFN 2012, I took a couple of weeks of break from training. Although I got a couple of rides in between along with a small run, the initial couple of weeks of break got extended to almost a month now, with additional trips to hometown during the festive season. Of course, with the festive season indulgences and complete lack of any sort of activity, I managed to touch 70 again after about 18 months of being close to my best weight of 66 kgs. I should say that I did not gain all of the 4-5kgs in this one month. This has been in the works for the last couple of months with continuously eating out and I was actually riding in TFN at around 69kilos. Although I hardly look like I gained any weight, both my weight scale and I could feel it. The interesting thing is, during my initial weight loss, I reached to 76 kgs from 92 and stayed there for almost a couple of years before a small lull in activity and a lot of eating pushed it back to the 80s again. That is when I took it seriously and started getting active again and reached 66 during training for TFN-2011. Although reaching 72 was my dream of sorts back then, I had no complaints with 66 and maintained it there ever since. But now, having spent time in the mid sixties, I feel terribly heavy at 69-70. I guess being in mid sixties became the new normal for me in terms of weight. If it is true that we tend to live up to what is our mental image of our normal selves, then I think I’m finally seeing myself as a lean guy after all these years. Speaking of which, there have been repeated queries from friends for posting pictures of my overweight self for a while. But I could not find any old pictures owing to lost data from an old computer crash. Luckily I chanced upon an old photo on a cousin’s computer on a recent visit to my hometown. I posted it on my FB a while back but here it is now on the blog. The one on the left is from a trip to Mysore when I was possibly around high 80s. Although that was not my highest weight, which was 92kgs, this is the pic I could find. The right one is the one after my sub-25 Nandi in Oct-2012. New Year and New Goals? 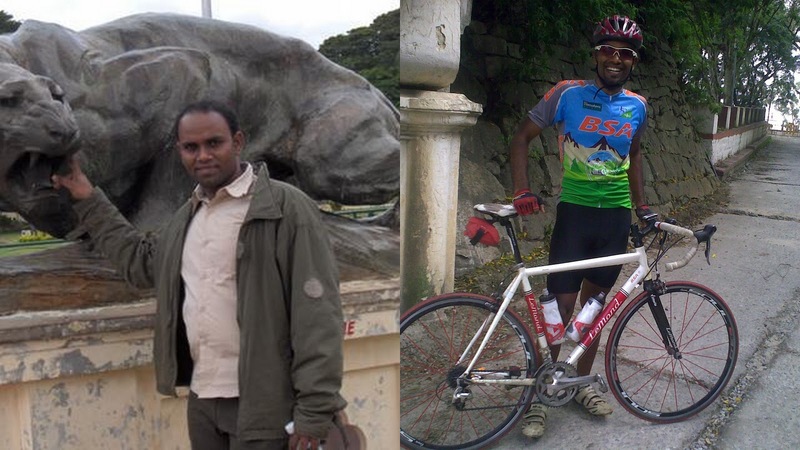 2012 has been a really fruitful year in terms of cycling. I’ve managed to cross the 16,000km mark in training and have about 19,000km including commutes. But I think this year, I would look at more modest goals. I want to get back to running. No, I’m not talking about Marathons. But just short distance running to begin with. I have not been able to get back to running regularly after my knee injury while training for what was supposed to be my first marathon in May 2010. But I think it is about time that I sort my running form and get back to it. With two young kids at home now, I intend to keep my wife sane by not disappearing for hours together every morning. I think the relatively shorter time that running needs would allow me to keep in shape while affording me to spend some more time with my young family. I still intend to ride at least 3 days a week. So, running 3 days a week, cycling 3 days a week and some yoga during running days. That is the plan for this year. In terms of goals, I would be happy with 10,000 cycling km this year and building up to 10km injury free by mid year(definitely) and half marathon distance(may be) by the end of the year in running. And yes, keeping the weight around 66kgs throughout the year. Also read: Other posts in the series here and here. What an inspiration is your pic, before and after. I could relate to the first para, because am the same, height also adds up to it. A clear plan for '13, wish you all the very best for your running and for all the fitness activities.